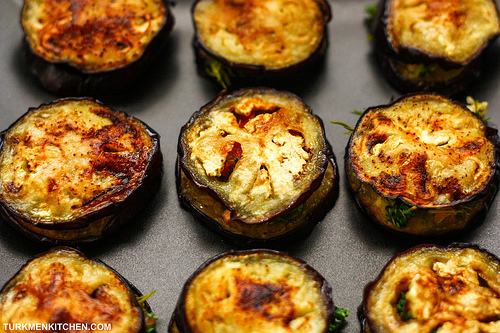 Soak eggplant rounds in a bowl of salted water for 15 minutes, then pour out the water. Heat oil in a large pan over low heat. Arrange eggplant rounds in a single layer in the pan, and cook, turning once, until tender and browned on both sides. 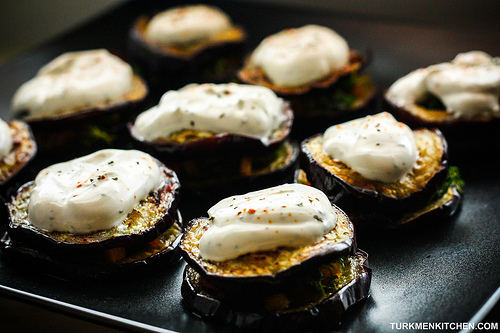 Remove cooked eggplant rounds from the pan and allow to cool. Meanwhile, combine the finely chopped ingredients in a bowl. Add lemon juice and salt. Mix everything together. In a small bowl, mix sour cream with dried mint and red pepper flakes. Transfer half of the eggplant rounds to a serving platter. 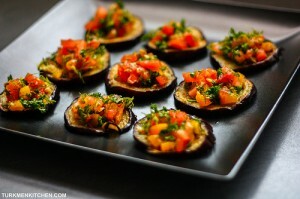 Top each eggplant round with a spoonful of the salad, then place the remaining eggplant rounds on top. Top each stack with a dollop of the sour cream dressing. Serve right away. R U REALLY A TURKMEN?